The rich stories and superb visual qualities of the Quahnarren landscape are brought to life by a wide range of illustration styles and techniques. Produced mainly in Adobe Photoshop and Corel Painter, these digital images provide an immersive opportunity to fully experience the world of Quahnarren – almost as if you were actually there, participating in the stories themselves. 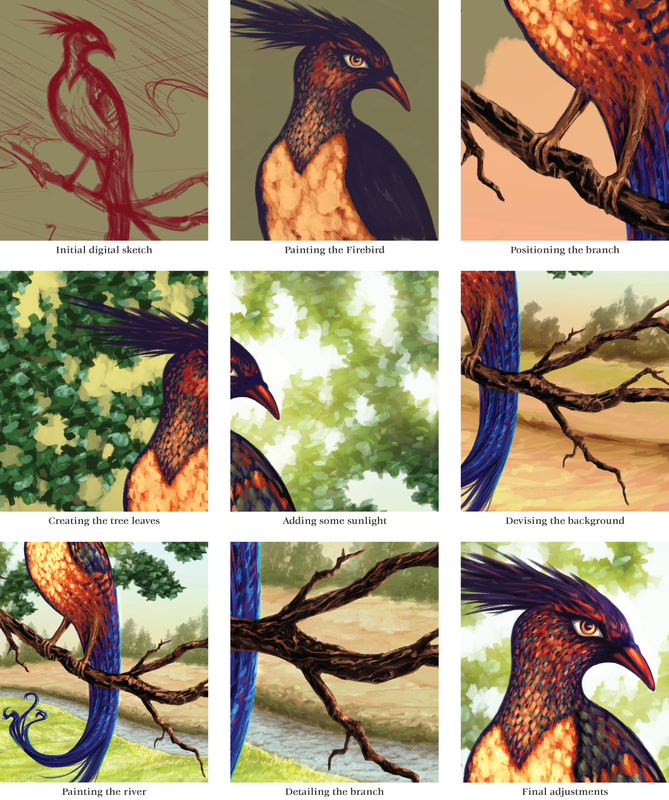 The exact methodology for creating these illustrations varies from one image to the next, but all feature similar stages of artwork development and progression. Starting from an original idea or sketch, a layout is devised to fit the format desired and the overall design focus of the content. This is then taken through to the initial blocking-in of the painting, where the tones and values of major shapes and elements are decided and refined, paying particular attention to areas of contrast and the general readability of the piece. Once this groundwork has been finalised it becomes appreciably easier to advance the illustration through the stages of rendering and detailing, where tones and colours are mainly settled, and any obvious mistakes are corrected. Often, at this point, a piece will shift dramatically away from the first concept, as new ideas spring out from the work completed – this give and take process becoming a continuous feedback loop between the creator and the art, as areas of concern are responded to and adjusted regularly to achieve better balance and impact. Final alterations, effects, and polishing are then completed, and the image is reviewed once again to ensure that all is completely finished and that the illustration is ready for release. Completion times will vary significantly for every piece, with some of the more complex and detailed images taking up to 40 hours to finish. This considerable time investment can be frustrating and taxing at times, yet the final result ultimately adds another layer to the visual history of this fantasy world. For those that have an interest in peeking behind the scenes, and are keen to witness the processes required to construct and produce the Tales of Quahnarren project, presented here are files showing illustration stages, concept sketches, and other pieces of material that offer some insight into the methods and techniques involved. Short animated clip showing the major development stages of The Silent Tower. From top, left to right, to bottom: Images tracking development on The Dreamer as work is completed on specific areas of importance, before making final balancing adjustments and detail improvements. 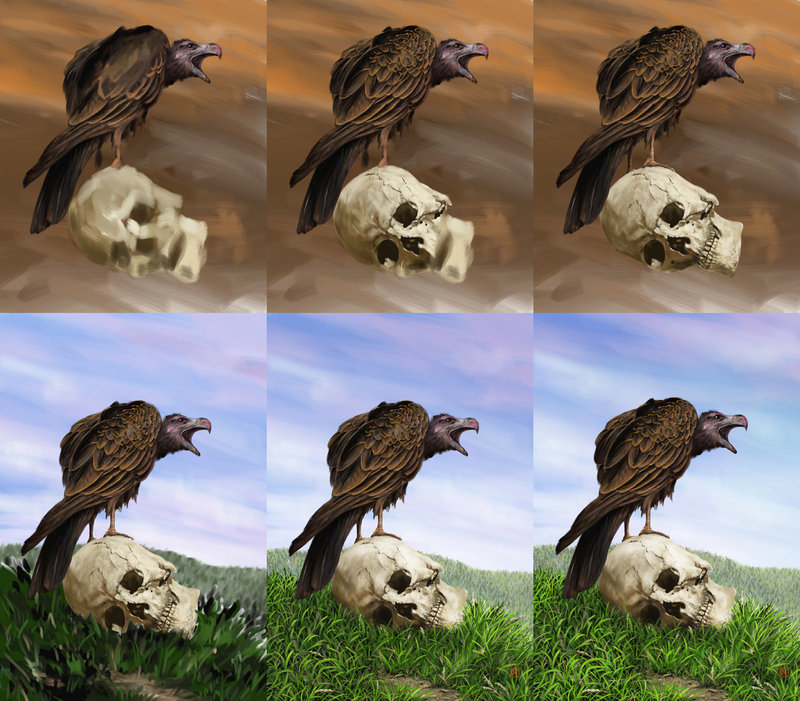 Development of Trial of the Alvaiser, from the initial black & white painting phase completed in Corel Painter, through to adding colour, details, and effects in Adobe Photoshop. From top, left to right, to bottom: Stages of production for The Battle of Velkonnen Plains, showing the transformation of the illustration from a simplistic digital sketch through to the final setting and taller format. From top, left to right, to bottom: Individual steps involved in the creation of Firebird. Clockwise from top left: Creation of Mystic Bazaar, starting with a quick digital sketch. 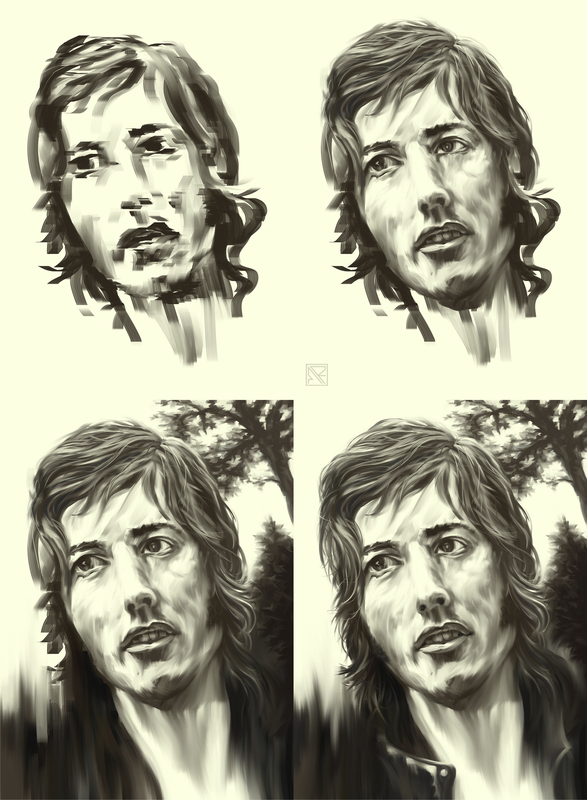 From top, left to right, to bottom: Stages of production for Great Statue of Tahsanook-Lai, showing the development of the illustration from a rough pencil sketch, which was then scanned and placed in Photoshop as the start point for the digital artwork. Clockwise from top left: Steps involved in the creation of Stone Column, showing the application of very quick strokes with a custom brush to build texture and suitable detail. Clockwise from top left: Steps involved in the creation of the Shrine of Rhast, showing the early correction of the point of view angle to accurately portray the height of the structure.